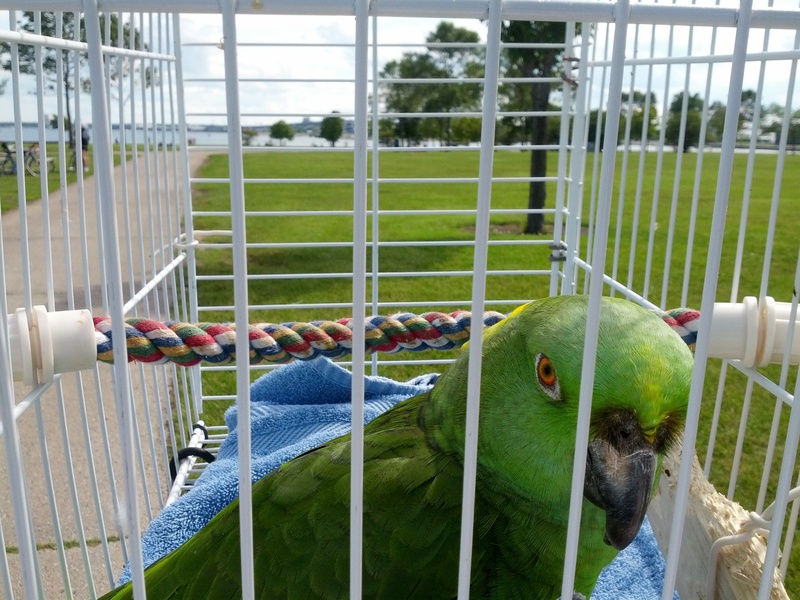 Barney is a Yellow Naped Amazon Parrot who loves to go on bike rides in his “Fun Cage” As of July of 2018 he has ridden more than 16,000 miles on his bicycle in the New Berlin / Waukesha area. If you see him while you are riding or walking, say “Hi”. He is always happy to meet new people. That’s amazing! We saw an immature bald eagle in a field along National, just east of Racine Ave some years ago. It was amazing! An eagle in New Berlin!!!!??? 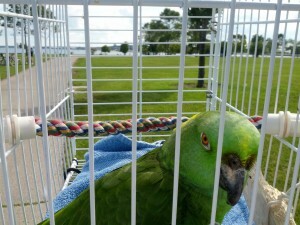 Barney the Biking Bird is at Glacial Drumlin State Trail. The sun finally came out so we went on a ride with Barney Sunday afternoon. He reached 16,000 miles of riding at Waukesha's Frame Park. It was nice to get out for a while after almost 3 inches of rain in 3 days. Barney reaches 15500 miles and picks up a hitchhiker! Why is Barney looking up? Check out what we saw on our April 24th ride on the New Berlin Rec Trail! Barney was worried til I told him that they eat mostly fish 🙂 He noticed it right away, I thought it was a red tailed hawk til I stopped and looked. I have never seen one here before so excited that maybe there will be a pair nesting somewhere near. I know that there are carp in the ponds by the trail. Theresa Zuck this is the bird that goes for bike rides past our houses😄 Have you guys seen him? Be on the lookout for a missing African Gray Parrot. Yea, I'd look & not touch myself. Love eagles such great birds.